The Food Co-op is having a potluck tomorrow evening, so today I’m working on pre-preparing stuff to bring, and also working on new recipes. (I’m also cleaning the house and putting off my “real work”). This artichoke dip has always been a favorite of mine – but I rarely make it because it’s kind of expensive (raw almonds, pine nuts, artichokes)…. I made up a double-batch and froze a good chunk of it, so we’ll have it on hand in case I crave it! 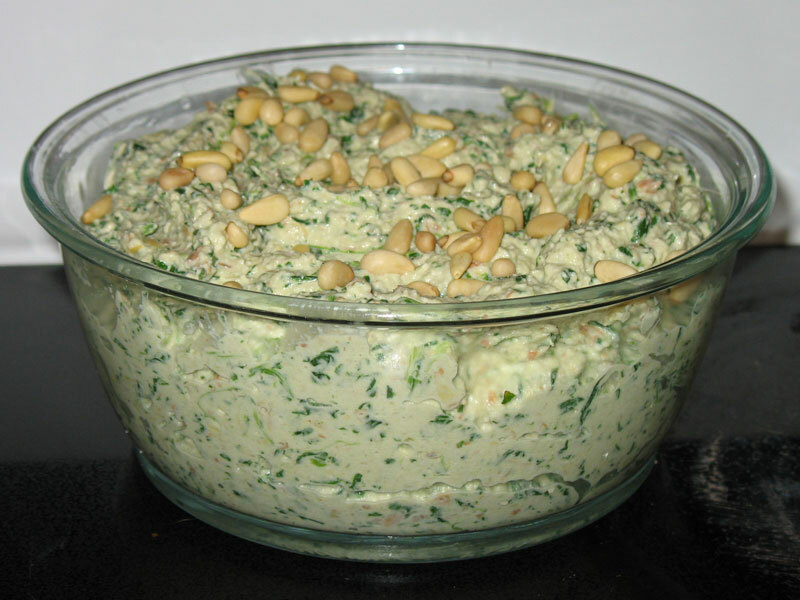 In a food processor, combine almonds, pine nuts, water, lemon juice, garlic, and salt. Process until smooth, scraping the sides once to work in chunks. Add half the artichoke hearts and spinach, process well. Add the remaining artichoke hearts and pulse until they are just incorporated. Chill and serve. I also made “imitation wheat thins” which turned out well, but are way too sweet. 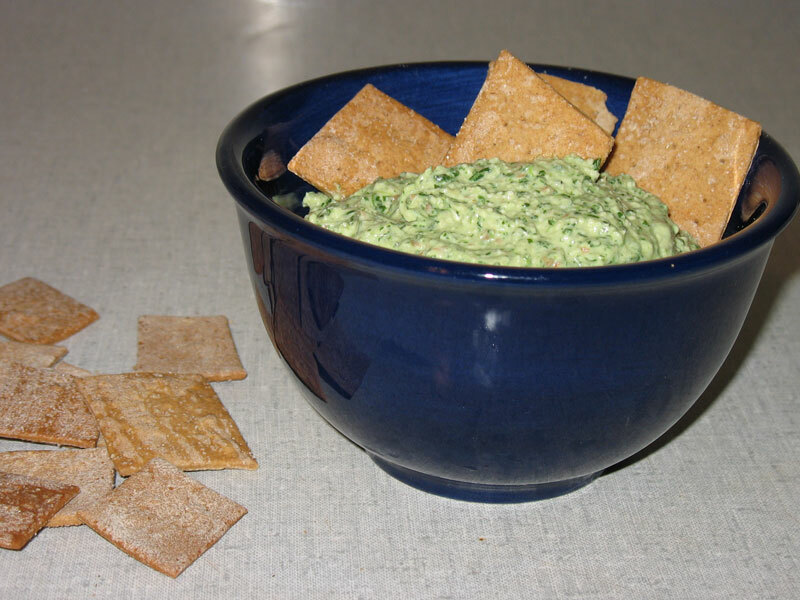 I’ll be modifying this recipe a bit, and hopefully be able to bring them with the dip to the potluck! We’ve been buying a lot of mock duck recently. For a while we were making food for Niko with it (she can’t get enough), but then it sort of became a staple. It’s simlar to – but not exactly the same as – seitan, which is incredibly easy to make. The canned stuff is imported from Taiwan – I don’t know too much about the brand (Companion). Our Food Co-op sells it for $2.79/can (10 oz.). White Wave makes some packaged seitan. But, beware: White Wave is a subsidary of Dean Foods, a distributor of Horizon Organic and Hershey’s! 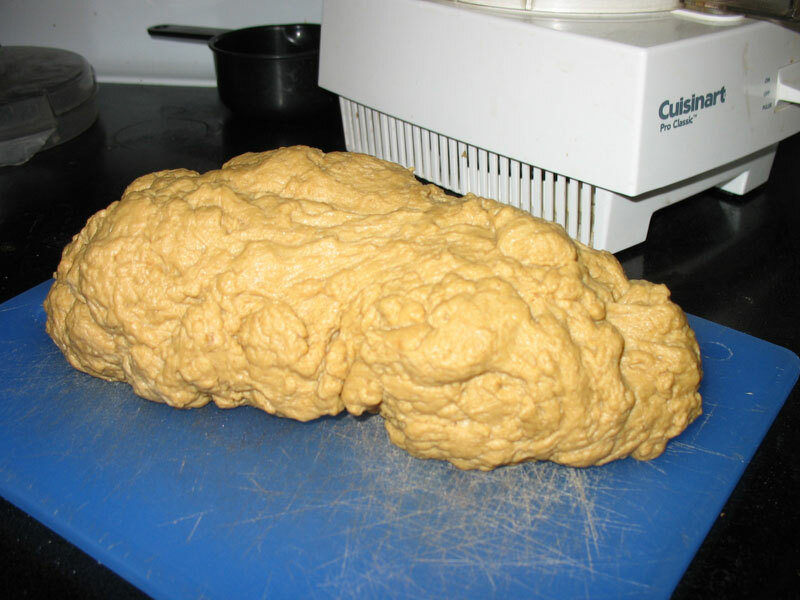 Rather than spend $2.79 for a 10-ounce a can (or supporting Corporate America), you can make a couple of pounds of seitan for about $5. If you have a food processor, preparation time is less than 2 minutes. (optional) spices and flavorings to taste. Cumin, coriander, garlic powder, onion powder, sage, rosemary, thyme, and chili powder are some ideas. Have another cup of water on hand. Start the food processor and slowly pour in the mixed liquid. The gluten should form a blob… you may need to add a bit more water, but the ball of gluten should completely absorb the liquid. It should look a bit moist, but should not be juicy. Process for 1 – 2 minutes. (You food processor will wobble like crazy). Take out the loaf and shape it into a log. It should be really stretchy and tough to tear apart. Let it sit for about 15 minutes. 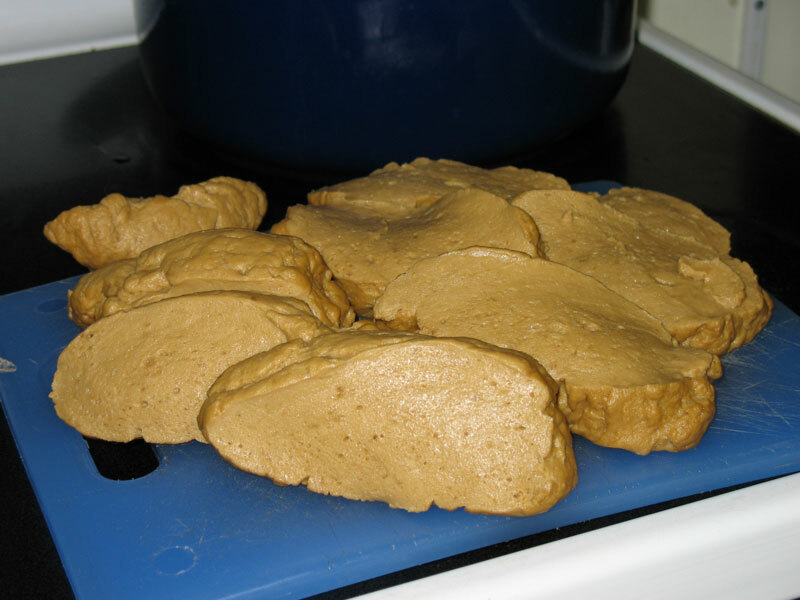 Cut seitan into manageable pieces. You’ll need a sharp serated knife (a steak knife works well). It’s a bit hard to cut, so I usually cut it into about 8 large chunks. Bring a large pot of water to a boil. 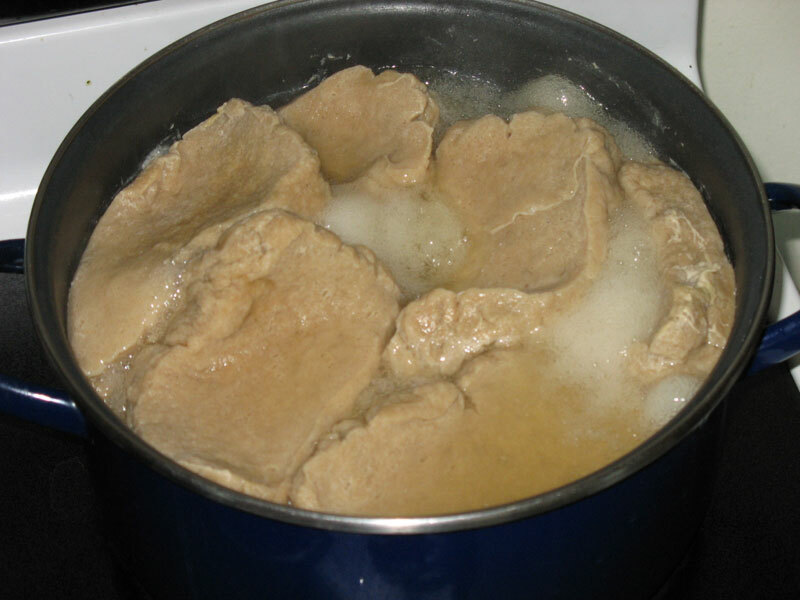 Drop in the seitan pieces (one at a time so they don’t stick together), bring back to a boil, reduce heat and simmer for about 10 minutes. Drain (reserve the liquid – it makes a good stock), cool, and cut into desired shapes. If the seitan cooked through (depending on how thick your slices are), you can eat them as-is. It’s much better after it’s been fried up with some onions. Actually, they are quite delicious. Especially when breaded, spiced, and eaten with a curry. I pulled some of the most beautiful green tomatoes I’ve ever seen out of the garden this afternoon. 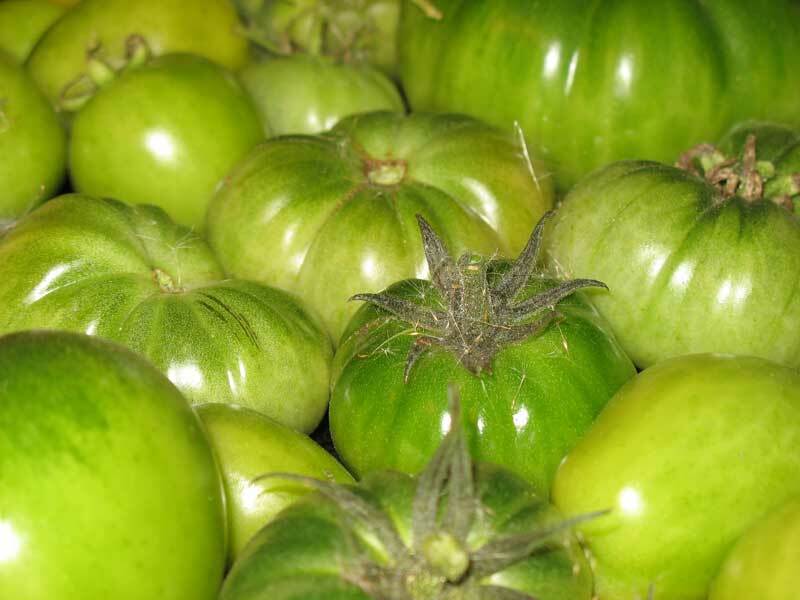 It’s kind of sad to see things come to an end (you can read all about this on our vegetable gardening website), and now I get to experiment with green tomatoes. I need to reserve some for a pie (in the event that my dad visits soon – it’s his favorite! ), and I used some a couple of weeks ago to make a green tomato and apple chutney – that’s pretty darn good! I imagine the chutney will only get better as it sits; I canned at least six pints of it. Last year I made a green tomato salsa, but I don’t have the rest of the salsa ingredients right now (well, except for extremely HOT chile peppers). I’m thinking some pickles. Tonight for dinner: the two vegetables that hold some taboo with many Americans. For either my third or fourth birthday party, my mom asked what vegetable I wanted served with dinner. I guess I enthusiastically replied, “lima beans!” and got my request. As the story goes, my cousin sat down at the table, looked at the lima beans, and said, “What did she do?” But, I was the kid who had a package of spinach prepared for my dinner while my parents ate baked potatoes and my brother ate fish sticks. I guess that most of my friends grew up with everyone in the family eating the same thing for dinner – I say, if it’s easier to make four different things that everyone will like, then so be it! (Of course, I haven’t ever had to cook for two kids before…).